DELIVERED AND SET UP FOR YOUR CONVIENCE! 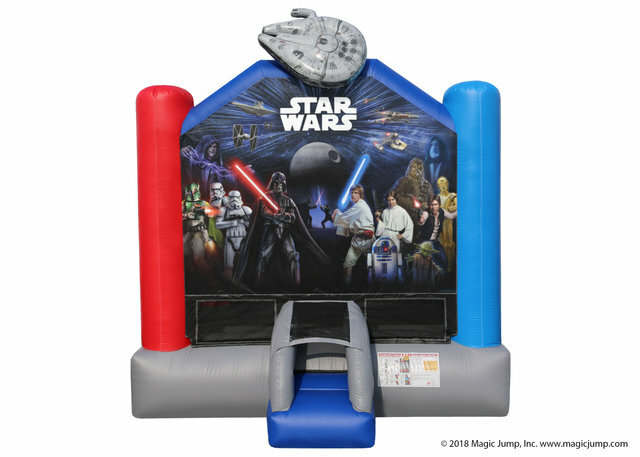 Grab Your light sabers and jump, hop and have fun in one of the best new inflatables we have. This amazing Star Wars inflatable will be the highlight to any party. Its vibrant colors will make and young jedi excited to battle it out with their friends. This Unit is great for all boys and girls and even comes with a basketball hoop on the inside. All new Disney inflatables come with a new safety entrance which is covered and hooks with a safety matt to make sure your young jedi's are all safe. This new inflatabel comes with an enclosed top and breathable sides. Also this unit has an escape hatch on the top incase the dark side attacks and the ship is blown. Bouncing On Air rents to all areas of WNY including Buffalo, Cheektowaga, Lancaster, Hamburg, Williamsville, Rochester, Elma, Marilla, Wales and many many more. EVERY JUMP IS CLEANED AND SANITIZED BEFORE AND AFTER EACH USE!